Iowa Soybean Association researchers continue to see significant declines in nutrient runoff on fields planted to cover crops. 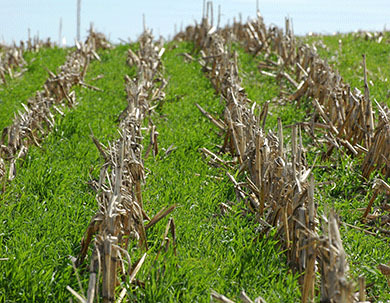 "This year, cover crops across the state reduced nitrogen concentrations in tile water by about 28 percent," says Adam Kiel, ISA's operations manager for water resources. "That's pretty much in line with what we've seen the past couple years. We usually bounce right around a 30 percent or so reduction in nitrate concentration from fields with cover crops." Kiel says another common question is how nitrogen application rates relate to nitrate concentrations in tile water. "Based on our data, there's not a strong correlation between nitrogen rate applied to corn and the concentration of nitrate that we see in the tile water," he says. "There is a little bit of an increasing trendline in the 100 to 150 pound application range, but anything above that is a pretty flat line. So there is not a very significant correlation between those two variables." ISA is presenting research results at meetings around the state. The next Farmer Research Tour event is Tuesday, February 12th in Cedar Rapids. Visit iasoybeans.com for details.